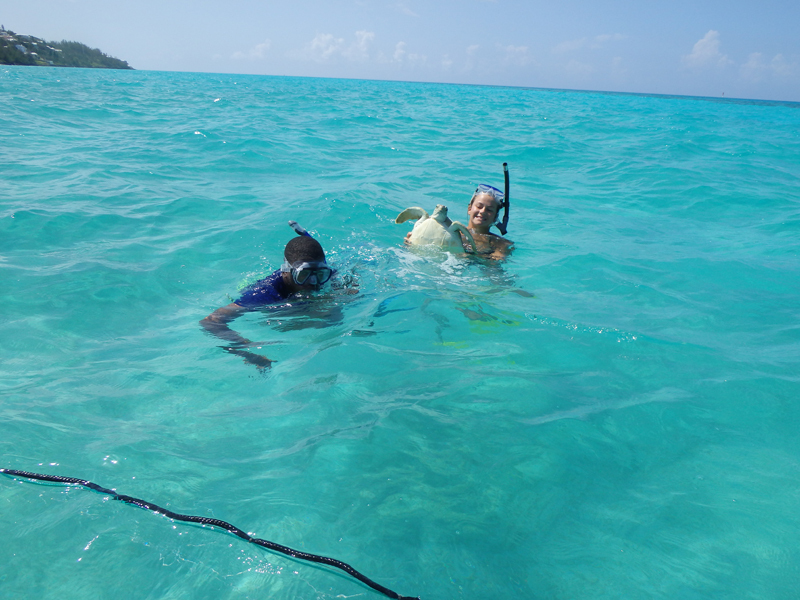 Thanks to a collaborative effort involving people from the Bahamas, Bermuda and the United States, a turtle satellite transmitter was located, allowing important data on sea turtle migration being safely recovered. “The Bermuda Turtle Project [BTP], a joint project of the Bermuda Zoological Society [BZS] and the Sea Turtle Conservancy [STC], has as its mission to promote the conservation of marine turtles through research and education,” the BZS said. “In 2016, as the project team carried out its 49th year of studying the green turtle aggregation that inhabits the waters of the Bermuda Platform, a remarkable story unfolded that brought together at least a dozen individuals from three countries who collaborated in the interest of sea turtle conservation and research. “The project’s annual two-week netting session to capture and tag immature green turtles residing on Bermuda’s seagrass flats took place 8 – 18 August during 2016. “Of the 225 turtles captured, three were selected to carry GPS-enabled satellite transmitters that were designed to reveal fine detail in the turtles’ use of Bermuda habitats and record their movements around Bermuda or to distant foraging grounds. “During the project’s history, over 160 long-distance migrations of Bermuda green turtles have been recorded based on tag returns, mostly to the extensive seagrass flats off the coast of Nicaragua, a distance of at least 1700 miles. But only 19 turtles have been followed using satellite transmitters that recorded their exact path of travel. 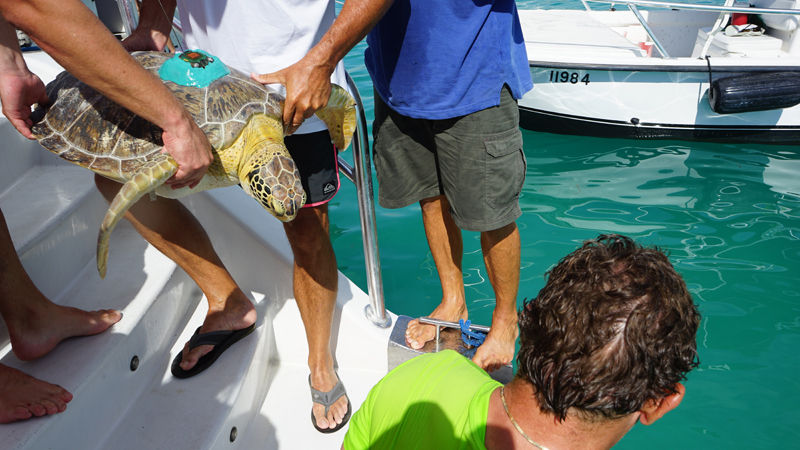 “One of the three satellite transmitters deployed in 2016 [PTT 163691] was attached to a 67.1 cm green turtle [tag number MM991] captured at Somerset Long Bay, Bermuda, on 10 August 2016. After release, the turtle, nicknamed “Hardy”, remained near Somerset Long Bay until 21 August when he began traveling clockwise around the Bermuda Platform. “He continued local travel until 27 August when he headed southwest off of the Bermuda Platform, into the deeper waters of the North Atlantic. Once off the Platform, Hardy’s travel rate increased to about 2.4 km/hr [1.5 miles/hr]. He traveled WSW for nearly 1 month, arriving at Cat Island, in the Bahamas, on 21 September. “Hardy then continued westward for 8 days across a mixture of shallow platform and deep waters between the Bahamas islands. What was thought to be his final satellite location was recorded on 29 September at the southeastern end of Andros Island. Hardy appeared to be continuing his migration when this transmission was received. Why the transmissions stopped was not clear. “To everyone’s surprise, after nearly two months of silence, the transmitter began sending location data again on 27 November 2016. Using Google Earth, BTP team members Robert Hardy and Anne Meylan could see from their office at the Florida Fish and Wildlife Research Institute in St. Petersburg, FL, that all of the transmissions appeared to be coming from a house in the community of Bluff Settlement, a remote village on the southeastern coast of Andros Island. “Recovering the transmitter would potentially mean recovering additional data, and also that this valuable GPS- enabled transmitter could be refurbished and used again. The team contacted Alan Bolten of the Archie Carr Center for Sea Turtle Research to try to find a sea turtle contact in the Bahamas who could investigate. “Alan put the team in touch with Liz Brace of the Bahamas National Trust in Nassau, who in turn contacted one of the trust’s wardens, Steve Smith, based on Andros Island. A flyer was produced and distributed in Bluff Settlement, showing the approximate location of the turtle’s signal and seeking the community’s assistance in locating the transmitter. “Weeks passed, and the BTP team was concerned that the battery on the unit would soon expire, greatly reducing the likelihood that the transmitter would be recovered. However, there was not much to do besides wait. “On 19 December 2016, Anne received an email from Patrick Talbot, Curator of the Bermuda Aquarium, Museum and Zoo. He had just spoken by phone with McRoy Wilson, manager of the Andros office of the Bahamas Ministry of Tourism, who reported that the satellite tag was now in his office at the tourism department on Andros. “Mr. Wilson had been contacted by the Bahamas National Trust warden and had retrieved the transmitter, then found Patrick’s phone number on the message glued to it. Patrick passed Mr. Wilson’s contact information to Anne and she called him immediately. “Mr. Wilson confirmed that he had the tag and reported that it had been found by a diver on a reef along the east coast of Andros, and that when it was found, it was no longer associated with the turtle. “This was consistent with the depth data transmitted by the tag when it was brought to the surface and resumed transmitting—the tag had been at about 20 ft below the surface the entire time it was not transmitting. No other details about the tag’s recovery were available. “The next challenge was to get the transmitter back to the lab in St. Petersburg where any untransmitted data could be downloaded. There is limited commercial airline service connecting the east coast of Andros with the U.S. but Mr. Wilson had a quick solution—a small airline called Watermakers Air that lands at an airstrip close to his office on Andros. “A call to Jennifer Valencia at Watermakers was all it took to arrange pick up at Congo Town airport the following morning, and delivery a few hours later at an airport in Ft. Lauderdale, FL. Jennifer called to report the transmitter’s safe arrival and shipped it to the Florida Fish and Wildlife Research Institute in St. Petersburg, FL. “The tag was a bit battered but still entirely functional. 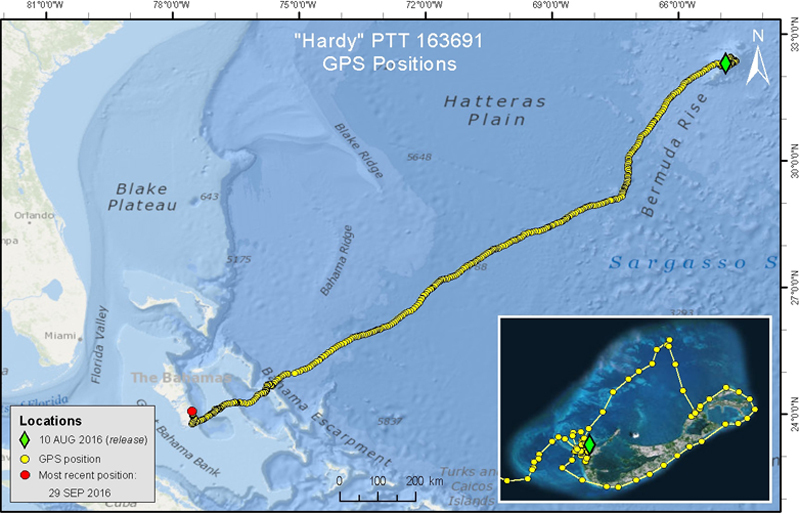 Robert Hardy [for whom the turtle had been named] downloaded the data stored on it and discovered that a large amount of information had remained on the tag—not just from the final days of deployment, but from the entire journey Hardy made from Bermuda to the Bahamas. “The number of GPS coordinates available for the travel path for this turtle increased from 365 to 785. With the added points, a remarkably complete track of the animal’s migration could be mapped. In addition to location data [latitude and longitude], the transmitter also recorded data on depth, temperature, and diving behavior.